In this guest post, Mandy Havert, Digital Research and Outreach Librarian in charge of Graduate Outreach Services, shares how to make the most of your Hesburgh Library experience. 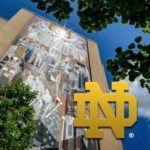 As a new graduate student or returning student at Notre Dame, you will find the Hesburgh Libraries has a lot to offer. Begin by checking out this guide for getting started with Hesburgh Libraries before you come to campus: https://resources.library.nd.edu/documents/faculty-checklist.pdf Once you have a campus network login – your NetID – you will be able to sign in and customize your library account. This includes being able to monitor the status of materials you have borrowed from our local collections or materials you have requested from other libraries. The “Events” section of the library home page is regularly updated and includes information about special events, exhibitions, and workshops. Be sure to check our events listings regularly. The Graduate Student Newsletter also includes information on these and other events and is delivered right to your mailbox! If you’re not sure where to start, you can reach out to the Graduate Student Services librarian, Mandy Havert – mhavert@nd.edu, to ask questions and receive some tips on how to get the most out of the Hesburgh Libraries. Mandy will fill you in on regular events, such as our weeklong Dissertation Camps, and regularly scheduled Dissertation Day Camps.